In the height of Finland’s winter months, darkness is something all too familiar to its residents; little surprise then that its artists exercise the right to explore the art world’s darker side – something that Kim Simonsson does relishes with open arms. Using the naïvety of youth as a vehicle to explore fantasy, nihilism and juvenile dissent, Simonsson crafts unexpected scenarios, largely dominated by cute young girls with an evil glint in their eye. 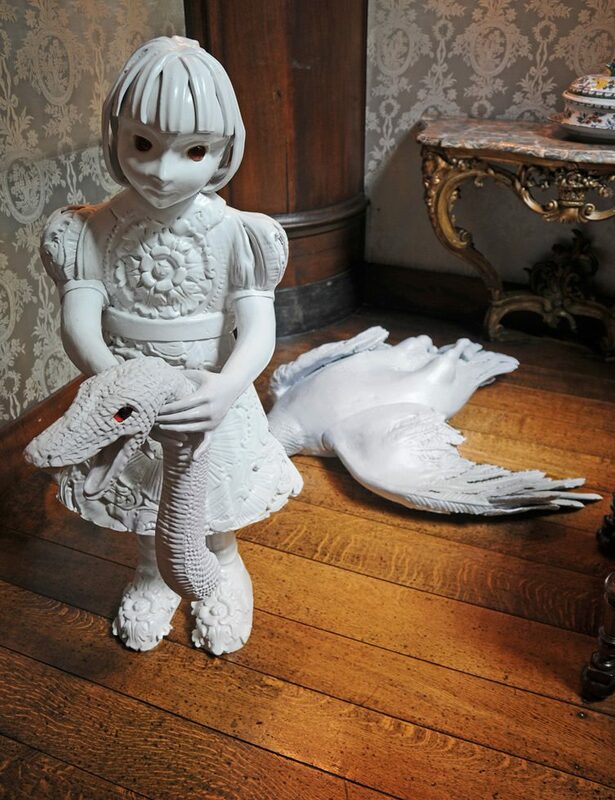 From the mild insolence of blowing bubbles, spitting and jumping in puddles to killing, erm, swan serpents – the Finn’s uncomfortable works are things of rare anarchic beauty. Kim, can you tell us a little about yourself? 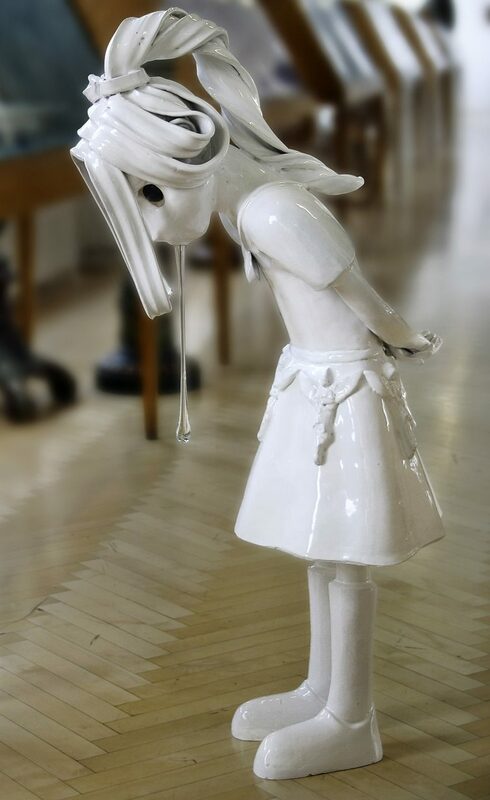 I am a Finnish sculptor using ceramics as my material. I graduated in 2001 from the University of Art and design in Helsinki (nowadays Aalto University) and then I moved to Toronto, Canada for three years. In 2004 I was awarded an important art prize in Finland and so moved back home. Japanese culture clearly has a strong influence on your work – is this something that’s had a major impact on you growing up? 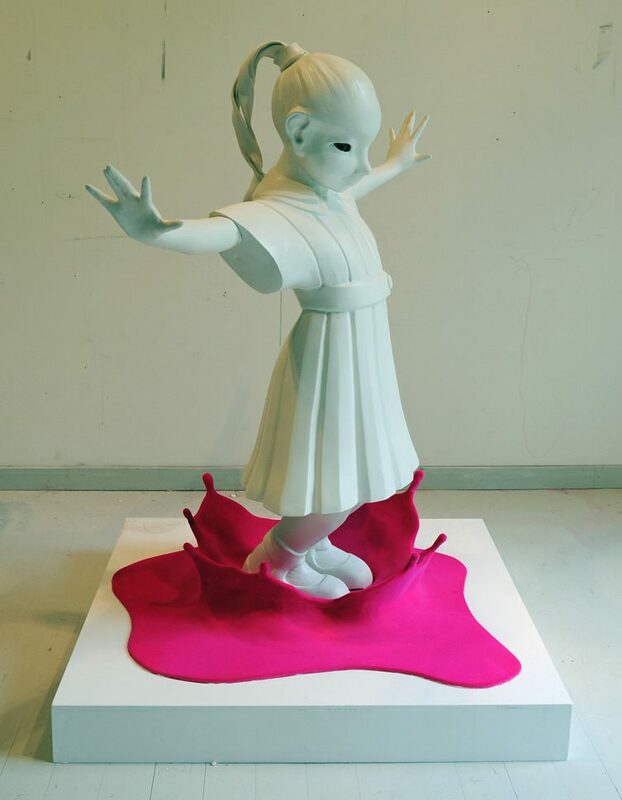 I never really followed Japanese popular culture, Manga or Anime, until I became interested in its aesthetic in 2002 when I saw some sculptures by Takashi Murakami, and drawings by Yoshitomo Nara. They looked so unique among the contemporary art that was made at the time, and I found their work hugely exciting. Does Finnish tradition and culture have similar effect on your art? I think there are some parts in my work that has to do with me being Finnish. There is definitely something sad and melancholic in my work. 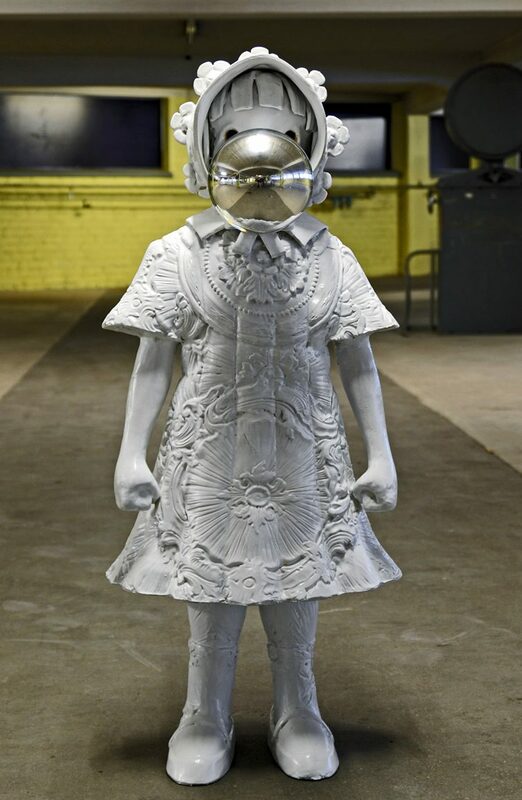 I could never do sculptures like Jeff Koons, who I think is a great artist. Your creations appear to enjoy challenging authority, is this a theme throughout your life/work? That was something that began when I was younger. I suppose every artist tries to challenge authority. 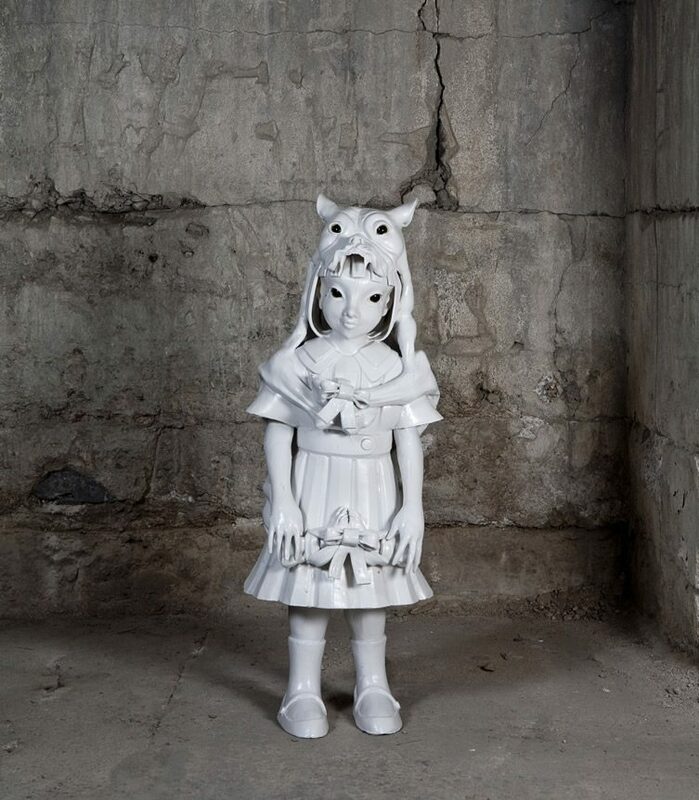 The unsettling nature of your works, I’m thinking Spitting Girl in particular, are at odds with the traditions of the material you use – what was it that drew you to ceramics? I started to study ceramics by accident. I wanted originally to be a painter. I have actually heard this same story from other ceramic artists. When I started to do my sculptures in the late ’90s there wasn’t many artists working with figurative ceramic sculptures in the contemporary art scene, so it had a surprise element. 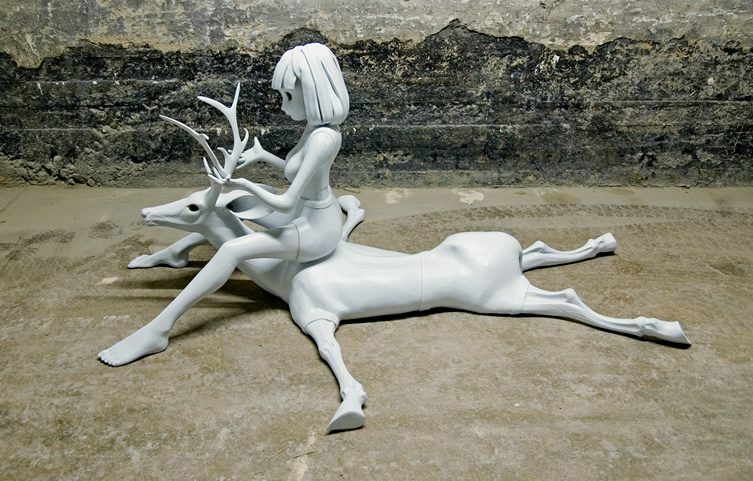 People expected something else when they heard the term ceramic sculpture, rather than what I was making. That was a big advantage. There’s a definite affinity between your works and the vinyl toy world – is this something you’d ever see yourself progressing into? Why not. I am making smaller sculptures with an edition of 30 from ceramics in addition to my larger unique pieces, so it could be logical to try something in plastic. I’m exhibiting some of my sculptures at an exhibition called Happy End? at Helsinki Art Museum, the show will open on the 25th August. There will be some great works by young Finnish artists but the main focus will be on the works of a Russian artist group called AES+F. I will also have two sculptures at a show called Body And Soul in the Museum of Art and Design in New York. This show will open at the end of September. When you’re not sculpting, where could we expect to find you? Throwing a tennis ball to my darling whippet Luru. What’s next for Kim Simonsson? To try to close deals on two public commissions. That’s what a sculptor should do, public art.